The Heiser home was built on the corner of South Park Avenue and Big Tree Road between 1901 and 1903. 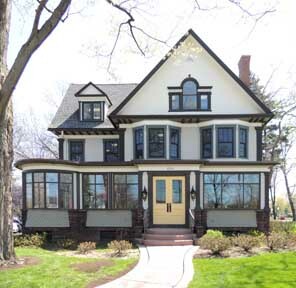 This spacious Queen Anne home was built by William and Mary Heiser and was the home of their daughter, Laura, and her husband, Spencer Trask, until 1947. In 1943, two Episcopalian nuns, Sr. Pattie Ellis and Sr. Gwendolyn Morgan, founded the Community of the Way of the Cross; in 1947, they purchased the Heiser home, calling it the St. David House It was painted white, maroon, and dark green and contained a chapel in the main room on the first floor. In 1991, Richard and Karen Penfold restored the building to its 1903 appearance. In 2013, most of the rooms were occupied by Baer & Associates.